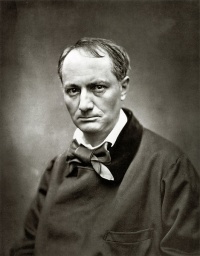 Charles Baudelaire (April 9, 1821 – August 31, 1867) was a French poet and art critic1 best-known for his collection of poems, Les Fleurs du mal and his dark romanticism. He was also a translator, most notably of the works of Edgar Allan Poe. He was romantically involved with Madame Sabatier and Jeanne Duval; and member of the Club des Hashischins. He is credited with coining the term "modernity" (in Le peintre de la vie moderne) to designate the fleeting, ephemeral experience of life in an urban metropolis, and the responsibility art has to capture that experience. Baudelaire was born in Paris. His father, a senior civil servant and amateur artist, died early in Baudelaire's life in 1827. In the following year, his mother Caroline married a lieutenant colonel Jacques Aupick, who later became a French ambassador to various courts. Baudelaire was educated in Lyon and at the Collège Louis-le-Grand in Paris. Upon gaining his degree in 1839, he decided to embark upon a literary career, and, for the next two years led a somewhat irregular life. It is believed that he contracted syphilis during this period. In the hope of reforming him, his guardians, sent him on a voyage to India in 1841, although he never actually arrived there. When he returned to Paris, after less than a year's absence, he was of age; but within a couple of years his extravagance threatened to exhaust his small inheritance, and his family obtained a decree to place his property in trust. It was in this period that he met Jeanne Duval, who was to become his longest romantic association. Five of the poems were suppressed, but printed later as Les Épaves ("The Wrecks") (Brussels, 1866). Another edition of Les fleurs du mal, without these poems, but with considerable additions, appeared in 1861. His other works include Petits Poèmes en prose ("Small Prose poems"); a series of art reviews published in the Pays, Exposition universelle ("Country, World Fair"); studies on Gustave Flaubert (in L'Artiste, October 18, 1857); on Théophile Gautier (Revue contemporaine, September, 1858); various articles contributed to Eugene Crepet's Poètes francais; Les Paradis artificiels: opium et haschisch ("French poets; Artificial Paradises: opium and hashish") (1860); and Un Dernier Chapitre de l'histoire des oeuvres de Balzac ("A Final Chapter of the history of works of Balzac") (1880), originally an article entitled "Comment on paye ses dettes quand on a du génie" ("How one pays one's debts when one has genius"), in which his criticism turns against his friends Honoré de Balzac, Théophile Gautier, and Gérard de Nerval. Baudelaire had learned English in his childhood, and Gothic novels, such as Lewis's The Monk, became some of his favourite reading matter. In 1846 and 1847 he became acquainted with the works of Edgar Allan Poe, in which he found tales and poems which had, he claimed, long existed in his own brain but never taken shape. From this time until 1865, he was largely occupied with his translated versions of Poe's works, which were widely praised. These were published as Histoires extraordinaires ("Extraordinary stories") (1852), Nouvelles histoires extraordinaires ("New extraordinary stories") (1857), Aventures d'Arthur Gordon Pym (see The Narrative of Arthur Gordon Pym), Eureka, and Histoires grotesques et sérieuses ("Grotesque and serious stories") (1865). Two essays on Poe are to be found in his Oeuvres complètes ("Complete works") (vols. v. and vi.). Meanwhile his financial difficulties increased, particularly after his publisher Poulet Malassis went bankrupt in 1861, and in 1864 he left Paris for Belgium, partly in the hope of selling the rights to his works. For many years he had a long-standing relationship with a bi-racial woman, Jeanne Duval, whom he helped to the end of his life. He had recourse to opium, and in Brussels he began to drink to excess. He suffered a massive stroke in 1866 and paralysis followed and the last two years of his life were spent in "maisons de santé" in Brussels and in Paris, where he died on August 31, 1867. Many of his works were published posthumously. Baudelaire's influence on the direction of modern French- and English-language literature was considerable. The most significant French writers to come after him were generous with tributes; four years after his death, Arthur Rimbaud praised him in a letter as 'the king of poets, a true God'. In 1895, Stéphane Mallarmé published a sonnet in Baudelaire's memory, 'Le Tombeau de Charles Baudelaire'. Marcel Proust, in an essay published in 1922, stated that along with Alfred de Vigny, Baudelaire was 'the greatest poet of the nineteenth century'. At the same time that Eliot was affirming Baudelaire's importance from a broadly conservative and explicitly Christian viewpoint, left-wing critics such as Wilson and Walter Benjamin were able to do so from a dramatically different perspective. Benjamin translated Baudelaire's Tableaux Parisiens into German and published a major essay on translation as the foreword. In the late 1930s, Benjamin used Baudelaire as a starting point and focus for his monumental attempt at a materialist assessment of 19th century culture, Das Passagenwerk. For Benjamin, Baudelaire's importance lay in his anatomies of the crowd, of the city and of modernity. Baudelaire's Flowers of Evil were put to an electronic setting in 1969. The poems were realized by Ruth White and released by Limelight Records. Baudelaire gives his name to the protagonist siblings in Lemony Snicket's A Series of Unfortunate Events. Baudelaire is referenced in Edward Albee's one act play The Zoo Story. The character Jerry asks Peter who his favorite authors are: J.P. Marquand or Baudelaire? Peter responds, "Baudelaire [...] is by far the finer of the two." Serge Gainsbourg was a fan of Charles Baudelaire, and used the poet's "Le Serpent Qui Danse" as the lyrics for his 1962 song "Baudelaire." Gainsbourg also refers to Baudelaire in "Rocking Chair," performed by Gainsbourg's then-wife, Jane Birkin, on her 1978 album Ex fan des sixties. Baudelaire is referenced in Amiri Baraka's play "Dutchman". The character Clay claims he once considered himself a black Baudelaire. Baudelaire is referenced in Jack Kerouac's 1958 novel The Subterraneans, where Kerouac compares the main character to Baudelaire's contrast in his works and in real life. Barry Perowne features Baudelaire as a main character in his novel A Singular Conspiracy, featuring a hypothetical meeting with Edgar Allan Poe during the months in 1844 unaccounted for in Poes' Life; as Poe (under an assumed identity) designs a conspiracy to expose Aupick to blackmail to free Charles' patrimony. H.P. Lovecraft begins his story Hypnos with a line of verse attributed to Baudelaire: if we did not know that it is the result of ignorance of the danger. In the film Withnail & I Richard Griffith's character recites the line "Laisse-moi respirer longtemps, longtemps, l'odeur de tes cheveux" which is from Baudelaire's poem 'A hemisphere in your hair' from Paris Spleen, 1862. The first chapter of the novel The Shadow Line by Joseph Conrad opens quoting Baudelaire's verses: ...D'autre fois, calme plat, grand miroir / De mon désespoir. Unless indicated otherwise, the text in this article is either based on Wikipedia article "Charles Baudelaire" or another language Wikipedia page thereof used under the terms of the GNU Free Documentation License; or on original research by Jahsonic and friends. See Art and Popular Culture's copyright notice. This page was last modified 14:19, 13 April 2018.